For the sake of her ailing mother, Marianne Denton becomes engaged to Noah Brennin—a merchantman she despises. But as the War of 1812 escalates, Jonah’s ship is captured by the British, and the ill-matched couple learns vital information that could aid America’s cause. Wow! MaryLu Tyndall’s done it again! After reading other books by this FANTABULOUS author, I knew I HAD to read this book! Not only did it sound absolutely wonderful, the cover was breathtaking. I could NOT wait to set sail with another inspiring historical book by the nautical Queen! A tender story of a marriage without love, perfectly created characters make up this deep romantic novel. I saw so much of myself in Marianne, for I time I could believe I was Marianne. I prayed for her and traveled her journey with her. I love it when an author makes me feel that strongly about a character! My heart is torn between liking Noah or like Luke. They were both wonderful heroes in my eyes! I would love to have one of them rescue me! When an author creates a high seas novel and you can FEEL the sway of the boat the characters are on as if you were there right beside them, you’ve got a stunningly talented author. I felt the wind in my hair, and the sea mist on my face throughout this entire story. Such a beautiful feeling! If you’ve never read one of MaryLu’s adventurous, wave crashing, heart-pumping, tender novels, PLEASE start with this 5 star book in the newest series! And for all you devoted MaryLu fans, this is her best book yet! 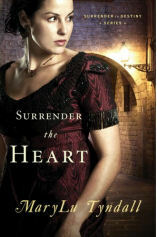 I’m on the edge of my seat with anticipation for the release of Surrender the Dawn, book 2!